Background: Currently, various approaches employed for treating diabetic wounds face several limitations. Since diabetic ischemia-related non-healing wounds cause economic burden and social problems world-wide, newer methods need to be developed to address the crisis. 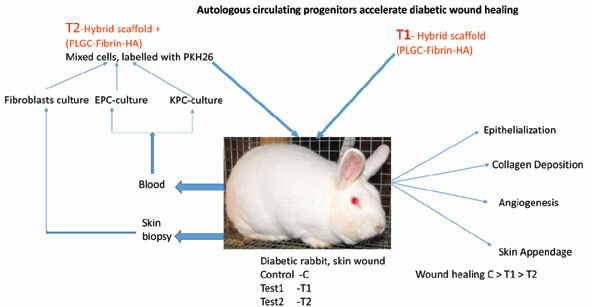 Objective: In this study, we tested a novel strategy of applying hybrid scaffold developed from synthetic biodegradable electro-spun poly[Lactide-glycolidecaprolactone] and bio-mimetic fibrin based matrix combined with autologous circulating progenitor cells on wounds in diabetic rabbits. Methods: The wounds created in rabbit ear were grouped into three categories: (i) untreated open wounds [control]; (ii) covered with hybrid scaffold [test1]; and (iii) applied with autologous progenitor cell suspension and covered with hybrid scaffold [test 2]. Replicate wounds were explanted at 3 time periods ending 28 days, gross tissue and histological sections were compared between control and tests. Healing parameters assessed were collagen organization, angiogenesis and epithelial coverage. Survival of transplanted cells at the wound site was tracked. Results: All wounds healed by 28 days; but, fastest epithelial healing and least scar formations were achieved when wounds were applied with progenitors and scaffold together. Collagen organization and angiogenesis were the best in Test2 followed by Test1 and was minimal in Control as compared to normal skin. Upon cell transplantation, healed skin thickness was near normal with appendage-like structures. Conclusion: Transplanted cells could be tracked till the end of the study through fluorescence imaging. The transplanted cells seemed important for dermal and epidermal regeneration. Even though a mixture of cells was transplanted, all of them can be harvested easily from autologous source and could be committed to respective lineage within few days. Therefore, it could be a potential strategy for regeneration of wounds in human subjects. Autologous cell transplantation, bio mimetic scaffolds, circulating progenitors, diabetic wound regeneration. Thrombosis Research Unit, Biomedical Technology Wing, SCTIMST, Trivandrum-695012, India.